When your car will not start, like any other person, you get frustrated and just wish you could get a new one. On a daily basis, I am reminded of my father’s teaching. He happens to be a mechanic with over 20 years of experience. Lucky me! In all honesty, it’s a blessing and an honor to be able to learn and put into practice his teachings and the teachings of his mentors. I currently handle one of the many vehicles that my parents have — a Ford F-150. Waking up one Saturday morning I decided to pop the hood up and take a peek under it. A few weeks back my father mentioned that the alternator needs to be changed. With that in mind I took it upon myself, and with the assistance of my mother, went into the parking lot. The alternator, the part that makes the engine come to life, the one that brings the electricity, and gas together to make the car roar. When handling this part of the car there is a specific way to go about it. So, here are the simple steps to safely remove and reinstall an alternator. Before anything can get unscrewed, you will require sockets, wrench, a piece of pipe, and a pair of gloves (preferably doctor type). It is always essential to have all things necessary to begin a job. “Si no tienes la herramienta adecuada, no se puede ser un trabajo,” or if you do not have the right tools, you can not do a job. When you do a job, it is not about wanting to get it done, you need to have the things that will make get the job done, build it up and make it work. 2. The alternator is connected to the battery. Disconnect the positive terminal and keep it away from the positive connecter. Getting an electrical shock is not a good sensation especially by an amount of 12.6 volts. It is of priority to disconnect the battery to be safe and not get surprised or injured. Do not be afraid to disconnect it, it will not shock you if you only are disconnecting from one of the terminals. 3. Once you have assured yourself that there is no possibility of being shocked, proceed in locating three screws that will require the use of the wrench and the right sized socket. Remove all three. 4. Proceed loosen the alternator through relieving the tension of the belt that is looped on the alternator. 5. Once you have removed the alternator, proceed to go and get the new one, from the most affordable mechanic shop of parts. 6. Redo steps 1-5 in reverse. It is important that you place all things back into the place you have removed it from, aside from the new alternator that is. Once you have reconnected the battery, open the key and see that if your vehicle is turning on properly. Give it a start and allow the vehicle to run for a bit. Do not be intimidated by a car’s intricate structure. As a young woman in today’s world, for me to disassemble and reassemble a vehicle is not just a physical challenge, because with practice I have been able to work on many parts of a car without automated machinery. In fact, working on cars has been a lifelong lesson and reminder that all genders can achieve many of the same things. It is important to remember that male or female, you are capable of doing many things, some which might surprise you. The key is to be focused, be safe, be productive and don’t be afraid to look under the hood. 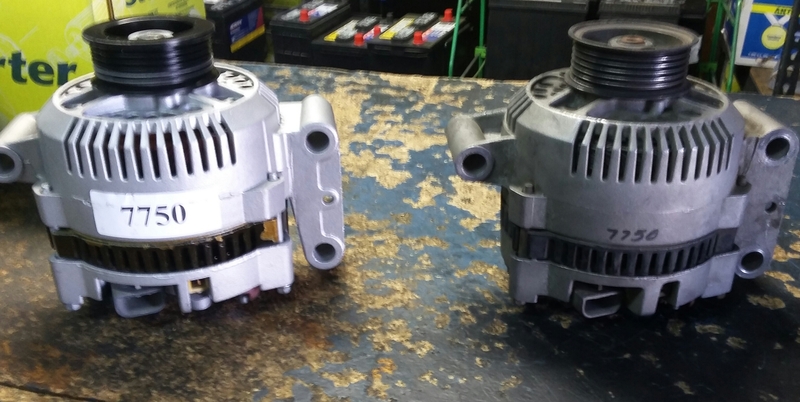 I suggest that you purchase the new alternator before removing the old one. That way, the truck spends the minimum amount of time possible being immovable. The worst thing possible is to go to buy the new one and discover that the shop does not have the correct alternator for your vehicle. You’ll need the information about your vehicle from the manufacturer’s plate — which is usually on the inside of the drivers’ door frame. It will tell you the model number of your vehicle and its date of manufacture; both of these are essential for getting the right alternator. And please tell everyone why you need “a piece of pipe” and what you want to use it for. Thank you. I hope all turned out well in this instance of mechanicking.